Volts is a competitive light weight PvP modpack focused around ICBM and related BuiltBrokenModding mods. The pack is designed around fast paced technological combat with base buidling. This includes large missiles for blowing each other up and guns from the Armory mod themed after World War 1. BBM stands for 'Built Broken Modding and Gaming' we are the last developers of the Universal Electricity team that created the original Voltz for Technic Launcher. When the team fully disbanded and when calclavia quit modding we gained everything from the UE team. This included all rights to update the modpack and continue it's mission. Before getting all excited and reading the plan remember this is subject to change. As well that parts of future phases can be implemented early. All ETAs are best estimates and can change at any time due to life reasons. Especially since most of the staff hold jobs or go to college full time. So expect delays every so often or modifications to the plan. The first major update is focused on just getting the modpack out of the door. It will be focused on just ICBM and some small mods. This means a lot of content will be missing but fear not, more updates are incoming. The second major update will focus on introducing machines from Basic Industries. This will include replacements for Mekanism, Galacticraft, Atomic Science, and include content from Resonant Induction which was planned for the 1.6.4 and 1.7.10 Technic Voltz releases. The third major update will focus on introducing a lot of fire power. This will include guns, cannons, more explosives, traps, and all those nasty toys of war. Think 40K orcs ready for war and you have an idea of how much firepower we are planning. The final major update will focus on base production and spy craft. This will include a major rewrite of MFFS to go along side with the classic version. As well as an upgraded version of military base decor and the introduction of spy mechanics. Spy mechanics include the ability to plant trackers and search for bases much easier. A: The pack is designed to have as few mods as possible so it will run under or near 2GB of ram. A: The modpack is designed for Player vs Player servers in a competitive setting. However, it is not limited to this gameplay but is recommended. Short term servers are recommended ss the map is going to get rather destroyed and should be regenerated every few months. Q: Voltz contained X mod why doesn't Voltz 2.0? A: We want to focus the pack around mods created by our organization. The original Voltz pack was handled in the same way as mods like Galacticraft and Mekanism were UE mods. The original goal of Voltz when it was created was to show off UE mods to the public. The pack just so happened to become popular and ended up being a PvP pack. Q: Why World War 1 guns? A: Minecraft is a more medieval game and does not reflect the modern world well. With this in mind, the closest technological era representing Minecraft that contains decent weapons is WW1. This way the pack can still have machines and rapid fire guns without losing the medieval feeling. Q: Doesn't Technic own Voltz? A: No, they simply hold a claim that is not actually valid. The BBM team has talked to the Technic team repeatedly about this issue with no resolve to the problem. Legally they hold no claim to the modpack itself, but do claim to own the brand of "Voltz". The claim though is flimsy as it is dependent on their claim that one of their staff members invented the name. Where we claim that calclavia invented the name with help from an ex-technic developer. As well, they have not filed any legal paperwork to copyright the name, product, or the brand itself. So as far as we are concerned we own the pack and name without a problem. Q: Will Technic fight over the name? 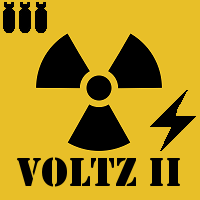 A: No, we changed the name from Voltz to Volts 2.0 to avoid this issue. As in an earlier conversation with the team, they expressed we could easily just change the name. Q: Why the long wait for a new version of Voltz? A: We actually did try to update the modpack several times over the years. Each time the pack was rejected by the Technic team due to instability. Though we later learned this was actually due to the Technic Team wanting to remove the modpack from their lineup. Q: Will the pack be uploaded to Technic? A: No, at least not until our issues with the Technic team are resolved. We hope this will be soon as our only goal is to make content that people enjoy. Q: What is your problem with Technic Team? A: We actually don't have a problem on our side as we have forgiven them and offered to be peaceful. However, the technic team is holding a grudge at this point because of a few bad conversations over the topic. We hope they will overcome those emotions and help us make great content. Slow, still working on Voltz-Classic and missing mods (Atomic Science). Hoping to get working on this version of the pack soon. What date will the Machines and Fire Power sections be completely done? Please, give me the at most time so I will be surprised. Less than a year if I keep up the current pace of development. Longer than a few months as we are working on Voltz-Classic at the moment. Will you release the pack on another launcher for an easier way to download? Ex: FTB, ATlauncher, or Curse? If not I'd be completely fine with installing it normally, I'm just looking out for the people who don't have experience in modpack installation. Great work by the way, keep it up! FTB is curse now, we are on curse, and ATLauncher died as far as I know. Pack should be easy to install through the twitch launcher (which was the called the curse launcher). Okay, sorry for the missed information. Haven't played on those launchers in a few years. I still refer to twitch as curse so that was on my part, my bad. I'll download it and check it out! No worries, I still call it the curse launcher myself. It really is confusing how they rebranded the entire launcher but still have the site the same.